FAKED PHOTO? WHAT FAKED PHOTO? The video is also available at the Honest Reporting site. On June 20, 1010, a Gaza-based freelance photographer went to an anti-Israel protest rally at an industrial area of the Gaza Strip. However, the picture that he took was not terribly exciting. It showed how few people were at this anti-Israel rally. But one thing caught his eye. Notice the gate at the right-hand side of the picture. The photograph had children stand behind that gate holding a protest sign. But even this was not terribly compelling. So then he had the children stand behind the bars and stick their arms through and then he took a picture from an angle. The results made it seem these children were actually in a prison. Strip in Gaza Cit on June 20, 2010. AFP. Now the newspaper doesn't have to use the caption a photographer submits. So when the Independent decided to run an article about Palestinian minors that were detained by Israel, they talked about children who were clapped in iron and then they ran this photo with no caption. How would anyone looking at this article know that these are not children in an Israeli prison, which was really outrageous. The Independent used the same picture two years ago. And now, we find it popping up in all sorts of articles and opinion pieces that slam Israel. There it is in Australia's The Age. So what can you do about it? Contact The Independent and demand they stop using these staged photos. The Independent has removed the faked photo that we exposed in our video. We would guess that the move was sparked by all the angry letters they received from HonestReporting members. While that's good news, it's not good enough. 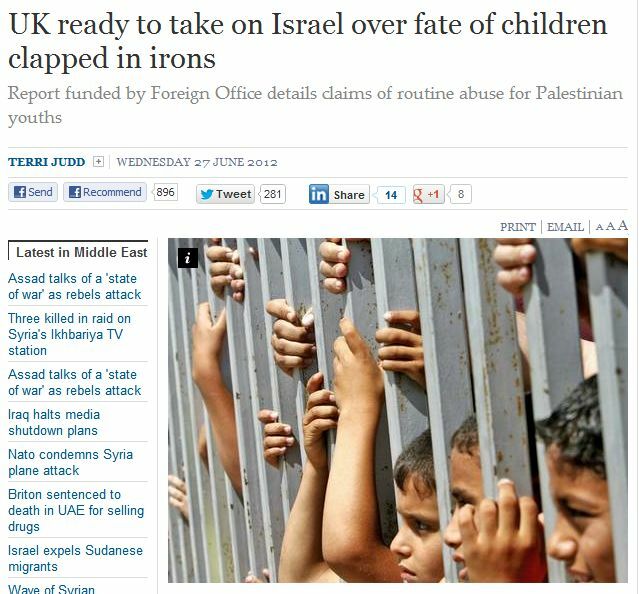 That's because the Independent has actually used this staged photo of Palestinian children pretending to be in an Israeli prison on more than one occasion. The right thing would be for them to publish an explanation of why they used an obviously staged photo. The right thing would be for them to assure readers that the same thing will not happen again. The right thing would be for them to agree not to use any more photos from the Gazan freelancer who set up and took the shot. It's not like they don't have an Errors and Omissions page. Think they will do the right thing? And remind them that this is how they originally published the article. Yarden Frankl is with the Jerusalem office of Honest Reporting. This article was published July 4, 2012 on the Honest Reporting website onestreporting.com/faked-photo-what-faked-photo/. We've reproduced The Independent article below. It describes alleged mistreatment of Palestinian minors detained in custody in the Territories (i.e., Samaria and Judea, mislabeled the West Bank by Jordan). The photograph was taken in Gaza, which is completely under the rule of the Hamas terrorists. The Independent knew this, of course. The Independent knew from the original caption that the photo was from a demonstration. not from a jail. Nevertheless, it used it to make an article that was doing well on its own in casting Israel in an evil light still more inflammatory. Much of the Territories is under control of the Palestine Authority; the rest is under Israeli military law. In 1968 when Israel reclaimed land that was legally hers under international law, the area was placed under Military Law. At the time, Israel believed that it was worth bartering this land for a genuine peace with the Arabs. Military rule continued, with the Government assuming the situation was temporary, and a peace treaty would soon be signed. The politicians ignored that the Arabs insisted then -- and insist now -- that what they want is Israel obliterated. They aren't looking for peace. The Palestinian Arabs train their children from the time they are toddlers to look forward to becoming suicidal murderers. As time has gone by, it is finally sinking into the Israeli consciousness that there is no point giving away her land for a meaningless promise of peace, especially when the Arabs increased their belligerency after the Oslo Accords. Voices are now demanding that Israel annex the Territories. If this happens, the treatment of minors between Israel and the Territories will automatically be equalized. The article is based on a Report by a group of British lawyers and jurors who visited Israel and the Territories in September 2011 for a week to investigate custody practices for Palestinian juveniles. The Report purports to compare treatment of minors in detention in the State of Israel versus the treatment of minors detained in the Territories. The Report implies that Israel treats Jews in detention better than Arabs in detention. (See cf Guiding Principles #14: "...no state is entitled to discriminate between those over whom it exercises penal jurisdiction on the basis of their race or nationality." and #20 "... highlights the fact that two different systems of law are applied by Israel depending on the nationality of the accused.") But in point of fact the Palestinian Arabs in the Territories are no different than the Palestinian Arabs in Israel in ethnicity and religion, and often are members of the same tribes and clans. The Report constantly talks about Arab youths under IDF military law versus children under Israeli domestic law. It neglects to mention that Israeli domestic law is the same for all Israeli citizens, Jews, Arabs and everybody else who's a citizen. But it would do little for their case, were they forced to say they are comparing Israel's treatment of Palestinian Arab youths VERSUS Israel's treatment of Palestinian Arab youths. "Children in Military Custody" assesses the treatment of Palestinian children under Israeli military law, examining each stage in the process: arrest, interrogation, bail hearings and plea bargains, trial, sentencing, detention and complaints. Notice the contrast is between Palestinian children in the Territories versus unspecified children in Israel itself. An honest comparison would contrast Palestinian Arab youth under Military law and Israeli Arab youth under domestic Israel law, with both considered relative to the laws that are in effect. It would also contrast treatment of the Jewish settler children in the Territories versus treatment of Jewish minors in custody in Israel. Another area that would warrant investigation in a serious study of Israeli practices would be to compare the behavior of the IDF Military to Military control of civilians in other places. The British in India, for example. The Report and the newspaper report of the Report also ignore that there's a crucial difference between arresting a Jewish teen standing on the sidewalk non-violently protesting a Jewish family being expelled from its legally-acquired home and a Palestinian youngster throwing rocks at cars driving by, with intent to kill. We are not told -- either in the news article or in the Report -- that in any dispute between Jews and Arabs, the Arabs are favored by the judiciary and the police. This is counter-intuitive, but factual and statistically demonstrable. The Arabs certainly know this and take advantage of it. In Israel, in a civil dispute between an Arab and Jew, the Arab is more likely to win, whatever the evidence. In Judea and Samaria, the Jews are not often given credence when the Arabs steal their flocks, burn their orchards and vandalize their homes. The police almost always take the word of the Arabs involved -- it saves them from being harassed by their own politicians, by anti-Israel NGOs such as Peace Now and by the foreign friends of the Po' Palestinians. The Report contains little or no physical evidence of actual abuse. As one example, the lawyers were appalled when they saw someone brought into court in irons. They neglected to ask about the usual practices or the circumstances in the case(s) they witnessed. They cite the UN Standard Minimum Rules that condemn the use of irons except for short periods or when a prisoner is trying to escape. The Minimum Standards Rules deals with prisoners in general, not children. The UN Document does state that children and adult prisoners are to be kept separated, but it is otherwise not prescriptive on handling young prisoners. It covers all aspects of the prisoner's life, and makes suggestions that would improve practices in primitive countries. It has no applicability to Israeli prisons, where even Arab terrorists are able to study for advanced academic degrees at State expense. In any case, the Rules are recommendations intended as guidance; they are not legally binding. There is no attempt to relate them to Military Law. The British group may perhaps be referencing the later 1985 "UN Standard Minimum Rules for the Administration of Juvenile Justice ("The Beijing Rules"), G.A. res. 40/33, annex, 40 U.N. GAOR Supp. (No. 53) at 207, U.N. Doc. A/40/53 (1985)." These provided "broad fundamental perspectives to comprehensive social policy" for juveniles, but few specifics. They dealt with attitudes, definitions and desired results applicable to ordinary practices in differing societies. Military issues were beyond their scope. The Report records complaints about the application of Military law, an area of law in which these learned lawyers appear to be unqualified. The indignation they demonstrate suggests they are humanitarians, at least selectively, but they are not arguing from law. The language may sound legal, but their personal opinions have no special standing. Evidence of mistreatment comes mostly from the children. I for one would be loathe to take the unsupported word of someone brought up from infancy to hate Jews and believes that killing them, or at least outwitting them, is the most glorious thing he can do. But they had no trouble accepting the versions of bad treatment put forth by the Palestinians and their partisans. They do note that the level of civilized practice the Israelis claim is frequently backed by audio-visual recordings and court procedures, but they feel free to ignore that evidence because there are "legal differences between Palestinian and Israeli children." Of course the governing sets of laws -- military and domestic -- differ. The differences in treatment are not because a child is a Palestinian and not a Jew. Perhaps the most ludicrous statements in the Report were those worrying about how the young Arabs might be psychologically traumatized by their treatment. Considering the joy at killing that is inculcated by Palestine Arab parents, who teach kindergarden children to take pride in inflicting pain and death, the British lawyers don't have to worry about psychological trauma. If the lawyers-investigators are as concerned about Arab children as they say, I suggest they investigate how children detained by the police are handled in Iran or Syria or Egypt or Saudi Arabia, especially if the child prisoners are not Muslim, or if they come from the wrong Muslim sect. And those children -- those that come out alive -- have burns and bruises and broken bones to substantiate their claims. As is customary in reports generated by Palestinian sympathizers, the report holds Israel to a higher standard than it does the Palestinian Authority, or for that matter, any Arab country. The Report ignores the Law as practiced in the Territories in areas administered by the Palestinian Authorities, where someone accused of "collaborating" with Israel is hanged on hearsay, without much investigation. On the other hand, Arab children whose stone throwing results in the injury or death of Jews are treated as heroes. Is it paranoid to suspect that the lawyers were less interested in protecting Arab children than in using them as a weapon to strike at Israel? The Report sounds high-minded, but it is sleeze. Impartial-sounding and polysyllabic sleeze, but sleeze, nonetheless. The team  led by Sir Stephen Sedley, a former Court of Appeal judge  heard that "every Palestinian child is treated like a potential terrorist". In a damning conclusion, the report points out repeated breaches of the United Nations Convention on the Rights of the Child, which prohibits cruel, inhuman and degrading treatment. "The UK government has had long-standing concerns about the treatment of Palestinian children in Israeli detention, and as a result decided to fund this independent report. While recognising that some positive recent steps have been made by the Israeli authorities, we share many of the report's concerns, and will continue to lobby for further improvements." While the legal team said it was in no position to prove the truth of the claims of cruelty made repeatedly by Palestinian children, but denied by the Israeli authorities  which offered unprecedented access to the delegation  it pointed to the disparity in the law. Israeli children must have access to a lawyer within 48 hours and cannot be imprisoned under the age of 14. But Palestinian children as young as 12 are jailed and can be kept for three months without legal representation. Between 500 and 700 are jailed each year. "The other shocking thing is they are incarcerated in breach of many conventions. The practical effect is parents can't get there because they can't get permits," said Marianna Hildyard QC. While the investigating team welcomed improvements introduced by the Israeli authorities, both Palestinian and Israeli lawyers on the ground insisted much of it was "rhetoric rather than real change". Last night, Israeli Embassy spokesperson Amir Ofek said the country appreciated the efforts of the delegation but blamed Palestinians who "glorify terrorism". He said: "As a result [children] are frequently involved in lethal acts. With the Palestinian Authority unable or unwilling to meet its obligation to investigate and prosecute these offences, Israel has no choice but to do so itself. "Israel notes the detailed recommendations in the report and will study them closely as part of its ongoing efforts to find the most appropriate balance between preventing violence and treating perpetrators with humanity."